New York City is the jazz capital of the world and spring is a perfect time to go out to jazz clubs and jazz concerts. One of the advantages of living here is that you can listen to an exciting new recording and then catch the artist or group performing in a local club or concert hall. I don’t know if the project was prompted by the current Broadway revival (or re-working) of the 1921 musical, but whatever the reason, we should be grateful. Asherie shows himself to be a resourceful interpreter, able to conjure up the styles of swing and stride but injecting later styles as well his own wit and lyricism. The most famous song, “I’m Just Wild about Harry,” appears in two different renditions. While some of the titles may be dated (such as “If You’ve Never Been Vamped by a Brownskin”), the music, especially when this well performed, is timeless. Judging from Rob Garcia’s new album, “Finding Love in an Oligarchy on a Dying Planet” (on Brooklyn Jazz Underground), he is not only a drummer, composer, and arranger of merit, but also a humanist. “People are Everything,” for which Garcia supplied lyrics as well as music, is a plea for tolerance of those from other cultures and races. The piece is affectingly sung by Kate McGarry. Garcia’s own group—Noah Preminger on sax, Gary Versace on piano, and Masa Kamaguchi on bass—shines throughout. There are two solo drum pieces that prove that Garcia can hold an audience’s interest all by himself. His love of tradition is highlighted by the opening track, Stephen Foster’s “Beautiful Dreamer,” and later by “Johnny Has Gone for a Soldier,” which features an exemplary bass solo. The Rob Garcia 4, with Noah Preminger, Leo Genovese, and Matt Aronoff, will hold a CD release performance at Smalls Jazz Club (https://www.smallslive.com) on Wednesday, April 27, from 10:30pm – 1am. You can also catch Garcia playing with likeable retro singer Svetlana and her group, The Delancey 5, at The Back Room (http://backroomnyc.com) on Mondays during April and May. “Perfection” (on Motéma) is the bracing new album by the self-described Power Trio of saxophonist/bass clarinetist David Murray, pianist Geri Allen, and drummer Terri Lyne Carrington. The album is dedicated to Ornette Coleman, who had died shortly before the recording session, as well as other giants we lost in the past year. The centerpiece of the CD is the title track by Coleman never previously recorded. Along with the trio, it features the bassist Charnett Moffett (who had played with Coleman along with Geri Allen), the trombonist Craig Harris and the trumpeter Wallace Roney Jr. (Allen’s son). ‘Perfection’ is the bracing new album by the self-described Power Trio. The members of the Murray Allen Carrington Power Trio have all made historic recordings separately, but together they are a force of nature. Although they are each capable of groundbreaking work, they also have a deep knowledge and appreciation of jazz’s history. The folk song, “Barbara Allen,” is given a mellow rendition, performed in memory of bassist Charlie Haden; “The Nurturer” is a ballad dedicated to the trumpeter Marcus Belgrave; and “For Fr. Peter O’Brien,” is a tribute to the Jesuit priest who managed the pianist and composer Mary Lou Williams. These pieces were either composed or arranged by Allen. Carrington penned “Samsara” for a living legend: saxophonist/composer Wayne Shorter. Her “Geri-Rigged” is for Ms. Allen, with whom she has played on and off for three decades, but also has a dynamic solo by Murray. Murray is as dynamic now as he was the first time I saw him many years ago at Studio Rivbea, where he played in a duo with drummer Stanley Crouch. Murray’s opening work “Mirror of Youth” goes through several styles, gaining steam as it progresses. His “The David, Geri & Terri Show” is just as inventive and unpredictable. The Power Trio will play at Birdland (birdlandjazz.com) from May 17 to 21. Another artist not to miss at Birdland is the sublime jazz singer Marlene VerPlanck. Judging from her new album, “The Mood I’m In,” the lady has discovered the Fountain of Youth. Though her first album was released in 1955, her singing could pass for that of a woman in her 20s. Her tone is firm and she still hits some awesome high notes. A singer of taste who concentrates on the lyrics, her album is an unhackneyed collection of mostly lesser known but worthy tunes by Duke Ellington, Bobby Troup, Harry Warren, and others. One of the better known songs, Burton and Lerner’s “Too Late Now,” is as fine a rendition as any I’ve heard. She sounds convincing on “Me and the Blues” about how she is through with romance because men are no good even though her own experience was the complete opposite. Her marriage to trombonist/arranger Billy VerPlanck lasted for 52 years, until his death, and she now has a music scholarship in his honor. Marlene VerPlanck will appear at Birdland on May 5. She will also perform on Saturday, May 21 at Trumpets in Montclair, (http://www.trumpetsjazz.com/)New Jersey. 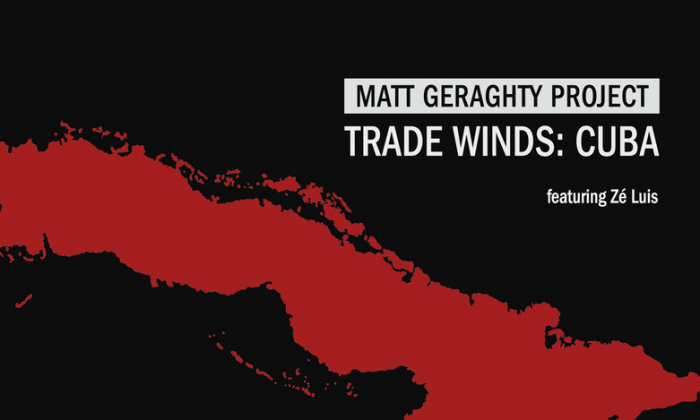 I don’t dance but the 2-CD set, “Trade Winds: Cuba” by Matt Geraghty Project, had even me bouncing in my seat to the irresistible rhythms. Bassist Geraghty and Brazilian saxophonist Ze Louis spent 21 days in Cuba with the goal of holding jam sessions with different musicians each day. They played with over 100 musicians in all sorts of venues, from studios to private homes, a garage and outdoors. The CD’s sound quality varies but the musicianship is on a high level. Geraghty will hold a CD release show at Subrosa (subrosanyc.com) on Wednesday, May 4.